OPEN HOUSE CANCELLED 3/24! LAKESIDE CHATEAU: THE COLLECTOR'S CABINET! This marvelous 14,000+ square foot estate in the French Chateau style is a treasure trove of architectural delights. Built by BOWA in 2005, this home demonstrates the value of quality construction with meticulous attention to every detail. Located just minutes from the village of Great Falls, this five-bedroom, 10-bath property evokes an atmosphere of respite and security, while at the same time portrays a well-curated collection of art! Turn onto the private drive to be immediately infused with a sense of magnificence. From the pea-gravel driveway complete with center roundabout, to the lushly landscaped coniferous furs that surround, an immediate sensation of seclusion envelopes. Reclaimed gothic doors from an Argentine Castle greet guests and welcome them into a light-filled, two-story foyer complete with a Tiffany stained glass window and chandelier from an Anheuser Busch warehouse! Throughout the first floor, vintage, salvaged oak floors are visible. Adjacent to the foyer, the gallery space is adorned with hand carved pine dado paneling from St. Luke~s Church in Glasgow, England. Complete with a hidden door, a panel opens to a concealed powder room that repurposes a 16th century baptismal font as a sink. Through the opposite end of the gallery there is a 500-gallon salt-water aquarium that flows through to the large chef~s kitchen. This opulent space is a dream! Adept for the most passionate culinary artists yet intimate enough for household gatherings, this kitchen has every feature imaginable. Dual islands, a warming-drawer, prep sink, range, and vintage elements such as the French castors on the island, Italian hand-painted tiles, a cozy ~keeping room~ fireplace sitting area, and the salvaged, stained-glass pantry doors tie this eclectic space together. There is even a special place for the household pets in their own unique cage crafted from a reclaimed Italian fence! The kitchen flows seamlessly into the informal great room with an extraordinary Renaissance carved limestone walk-in fireplace from Burgundy, France as the centerpiece. Hand-carved wood beams and a wood-clad, vaulted ceiling finish off the space. Adjacent to the great room is the receiving room that continues the display of worldly treasures. Opening through the antique Chinese doors another smaller scale fireplace can be found flanked by two astonishing stained-glass windows. These rare pieces are reclaimed from King Street Methodist church in Manchester and depict David Livingston delivering the gospel to Africa and George Handel~s Messiah. Just down the hall and off of the stately yet comfortable dining room is a considerable wine cellar with an advanced temperature control system fit to store fine treasurable libations from future world travels. After dinner, adjourn to the Indo-Portuguese-inspired cigar room upstairs with a majestic entrance created from two salved doors circa 1860 for a cigar, brandy, and an anecdote from the most recent exploration! All of these amazing architectural features in just the entertaining spaces! The luxury continues in the first floor master suite as well as three other ~mini~ suites with en suite baths. In addition, there is a gym with functional reclaimed quatrefoil door, designated craft room, billiard space, and French doors leading to gorgeous outdoor spaces. Outside in the rear, an enclosed porch and multiple terraces overlook a luxurious custom pool, spa, landscaped grounds and private lake bordering the property~s 5+ acres. A three-car garage, generator and underground sprinkler system provide additional conveniences. High-end construction elements include slate roof, copper gutters and stone-clad exterior, providing exceptional insulation and low maintenance. 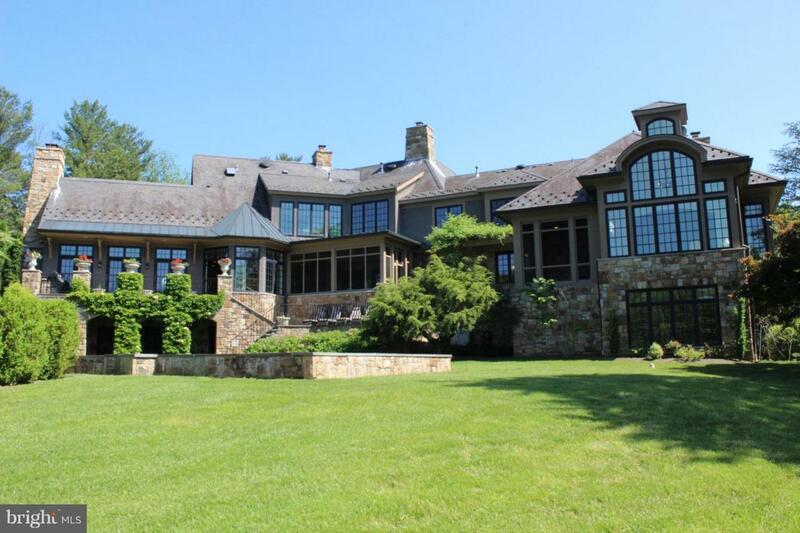 This estate is remarkably stunning in every way. An abundance of artistic treasures with all of the modern conveniences!